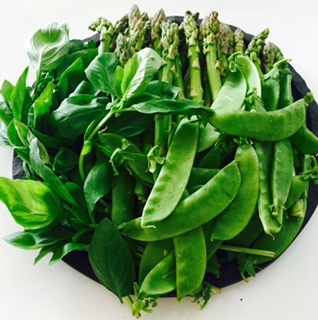 This post takes it’s inspiration from our in season abundance of beautifully fresh and vibrant spring greens. Casting around for something new and interesting to try, I recently stumbled across The Huffington Post’s article Donna Hay Has Reinvented Risotto and It’s Spectacular. A risotto containing no carbohydrates or rice. Just tender, in season asparagus spears blitzed in the food processor to resemble grains. A technique I’m very familiar with having already experimented with “ricing” our winter staples of cauliflower and broccoli in previous posts. Donna Hay’s reimagined asparagus risotto is fresh and light. A welcome counterpoint to winter’s comforting and much starchier rendition. After witnessing a huge platter brought to the table seemingly inhaled before my eyes, I’m inclined to agree with Huff Post’s verdict that this version is pure genius. In my eyes, it’s a healthy, feel good bowl of green deliciousness. Even better it’s easily adapted into an inspired 5-2 fast day recipe idea. As much as I love fresh balls of buffalo mozzarella (and even more decadently creamy, oozy burrata; in my opinion most possibly the heavenliest cheese on earth), to render Donna’s idea into an effortless fast day offering I’ve halved the quantities of cheese used in her recipe and used lighter bocconcini. As originally stated a 250g ball of buffalo mozzarella accounted for a whopping 595 calories. Undeniably significant when you consider all the remaining ingredients combined yield just under 520 calories. One simple substitution brings each enormously satisfying serve in at just 186 calories, with no dilution of any of the flavour and just a little of the richness. Of course I’d happily make this dish on a feast day, using as much buffalo mozzarella or its even creamier cousin; burrata as I please. SNAP off woody ends of asparagus and discard. Place asparagus in large bowl of food processor in two batches and pulse until it resembles rice. Set aside. HEAT oil in a large saucepan over medium heat, add onion and garlic and cook for 2–3 minutes or until softened. INCREASE heat to high, add asparagus, stock, salt and pepper and cook for 6–8 minutes or until asparagus is just tender. 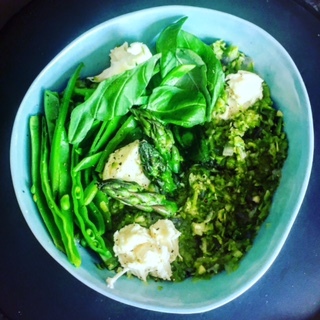 DIVIDE asparagus risotto between bowls, top with snow peas, torn bocconcini balls and basil and sprinkle with pepper to serve. I know. I have a confession to make. It’s been over a month since my last post. Not intentionally by any means, more of an unplanned sabbatical. Sometimes everyday life just takes over and before you know it time runs away. Each day slips into the next, a week passes and then another. Granted life has been busy chez nous, so it’s hardly surprising starved of attention my once faithful muse abandoned me. Literally and figuratively. So much so I’ve merely been going through the motions in the kitchen. On rotation and uninspired; nothing new to write about there. In the past month I also managed to miss my blog’s three year anniversary. Has it really been that long? Perhaps I simply ran out of puff. It’s often said it takes just a month to break or establish a habit, and I’m inclined to believe that statement might just be true. 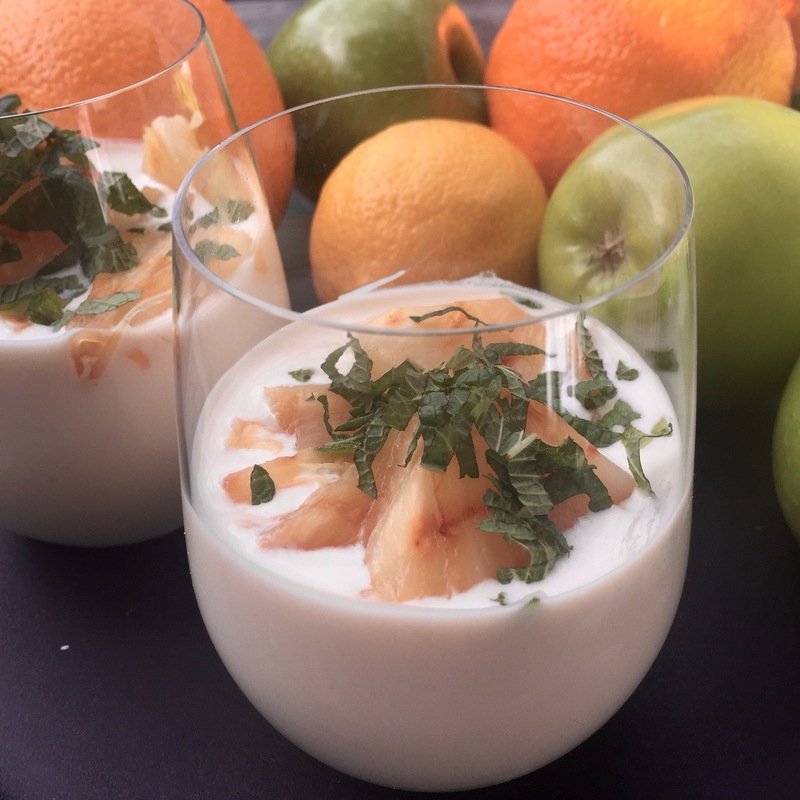 In an attempt to reignite my mojo I’m easing myself back into blogging with a taster of the fool proof kitchen shortcuts that have been the mainstay of my family’s dinner table over the last few weeks. A perennial favourite in our house? Anything pasta and meatballs. When time is scarce, I squeeze my “meatballs” out of the casings of good quality Italian pork and fennel sausages into a simmering saucepan of tomato sugo (simply prepared using tinned tomatoes). Throw in a promise of “gnocchi” , and I can always be guaranteed to co-opt a willing helper or two to come on board and help out. In our house a quick fix version of gnocchi means substituting ricotta cheese for the more time consuming preparation of potato. Light, fluffy and delicious they can be prepared and cooked in no time at all. Our record? Around 20 minutes. Simply set a large pot of water on the stove to boil, as you bring together a soft dough of ricotta, eggs and flour. Once rolled and cut, the gnocchi only need to be dropped into the simmering water until they float to the top. Mixed with the meatballs and sugo, they really do make a delightful kitchen shortcut. PREPARE the ricotta gnocchi according to the recipe below. ADD garlic and crushed chilli flakes. Sauté until fragrant. STIR in the canned tomatoes and cook until the sauce begins to thicken a little. Break down the tomatoes with the back of your wooden spoon as you stir. ADD herbs,balsamic vinegar and sugar. Stir well to combine. Turn the heat down to low and simmer until the sauce is rich and thick. Season to taste with salt and pepper. SQUEEZE walnut sized balls of sausage meat out of their casings directly into the pan of simmering sauce. Cook for a further 5-10 minutes until meatballs are cooked through. TOSS cooked gnocchi through the meatballs and sauce. Sprinkle with grated parmesan cheese to serve. PLACE ricotta in a bowl with grated cheese, eggs, nutmeg, white pepper and salt. Add flour and mix to form a dough. KNEAD lightly, adding a little more flour as necessary until the dough is manageable and not too sticky and wet. Be careful not to overwork. 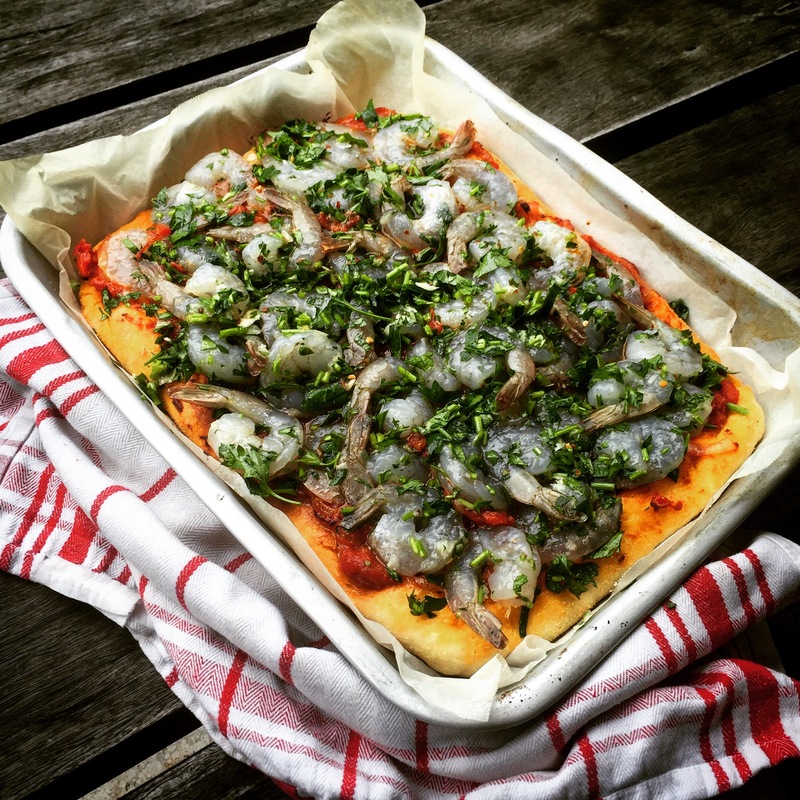 BREAK off quarter portions of the dough and roll into 2 cm diameter logs on a floured board. Cut into 3 cm lengths. Optional: If you have time indent each piece by rolling over the back of a fork. PLACE on a floured tray until ready to use. COOK gnocchi in two separate batches in the pan of simmering water. Remove with a slotted spoon one or two minutes after they float to the top. DRAIN quickly on paper towels and transfer to a serving bowl ready to be tossed through with sauce. I’m definitely a late comer to the masala chai tea party. My first taste was frankly quite off putting – a very bland and thin offering concocted with a barely waved chai tea bag introduced into a pot of hot water. A jug of cold milk on the side. Politely I accepted a cup and wondered what all the fuss was about, making a mental note to stay well clear. Until recently a friend insisted I try a properly made wet chai. What a difference a good brew makes. Chai simply translates as “tea” in Indian and masala chai as “spiced tea”. There are no hard and fast rules as to which spices to use but most contain a heady and warming mix of cardamom, cloves, cinnamon, pepper, ginger and star anise. You can buy chai spice mix ready to be added to loose leaf black tea or premixed chai tea at specialist tea shops and upmarket grocers. 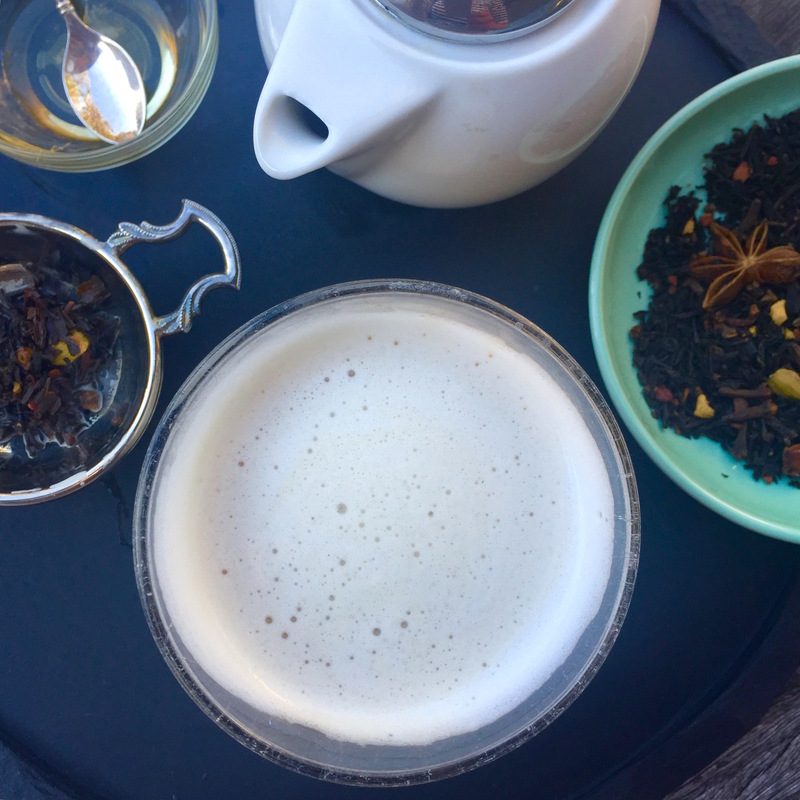 Of course you can always put together your own spice blend, if so inclined, a suggestion for an easy home made loose leaf chai spice tea blend is included at the bottom of this post to get you started. Spiced tea leaves in hand, I prefer to brew up a chai concentrate, use what I need and store the remainder in a glass jar in the refrigerator, ready to go. As I love to add freshly frothed milk to my spiced tea – masala chai latte has fast become my brew of choice. A worthy rival to my beloved cappuccino, no less. And as I’m feeling particularly generous, I’ll let you into a little secret – it’s always easier to create a creamier froth using skim over regular milk with an espresso machine at home, hence skinny masala chai latte is the go. With just 83 calories per cup serve, it also happens to tick all the boxes for a perfect 5-2 fast day pick me up. Deliciously warming and satisfying, proof that fasting doesn’t need to be boring or anti social. POUR 1/3 cup warm chai concentrate into a glass. STEAM and froth 2/3 of a cup skim milk and add to the chai concentrate. I find it easiest to use my espresso machine’s frothing wand. Alternatively warm milk in a small saucepan on the stove top over low heat, then use an immersion or stick blender to froth milk. ADD honey to sweeten. Serve. 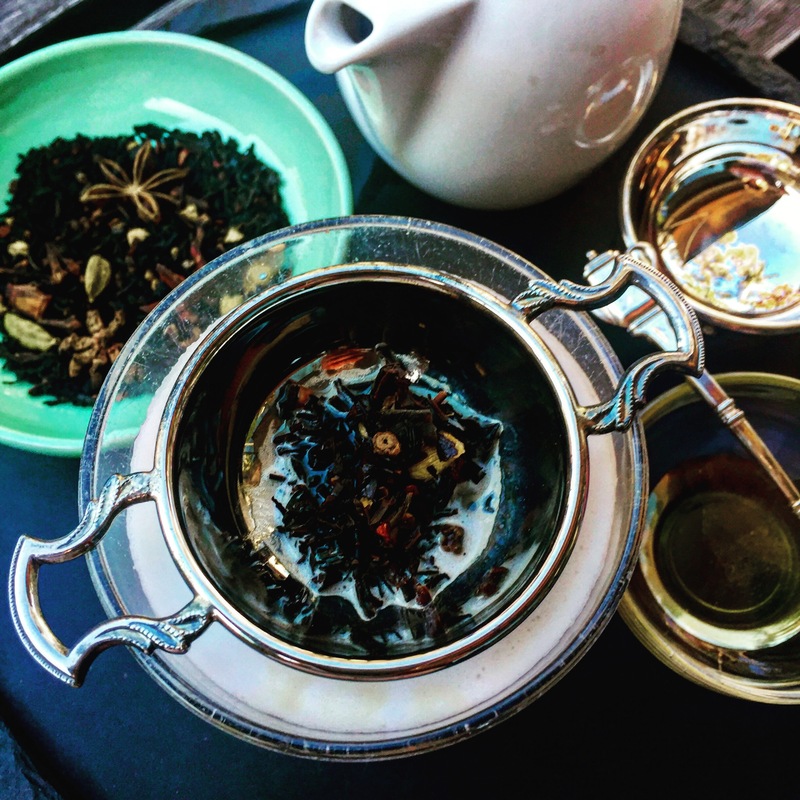 PLACE chai spiced tea blend into the infuser of a two cup teapot , add freshly boiled water. ALLOW to steep for 5-7 minutes. Remove the infuser, use immediately or allow to cool and refrigerate in a glass jar until required. DRY ROAST the spices in a hot oven until aromatic. Transfer to a mortar and pestle and pound until coarsely crushed. ADD assam loose leaf tea, stir to combine. Store in an air tight container until required. Bienenstich means bee sting in German. 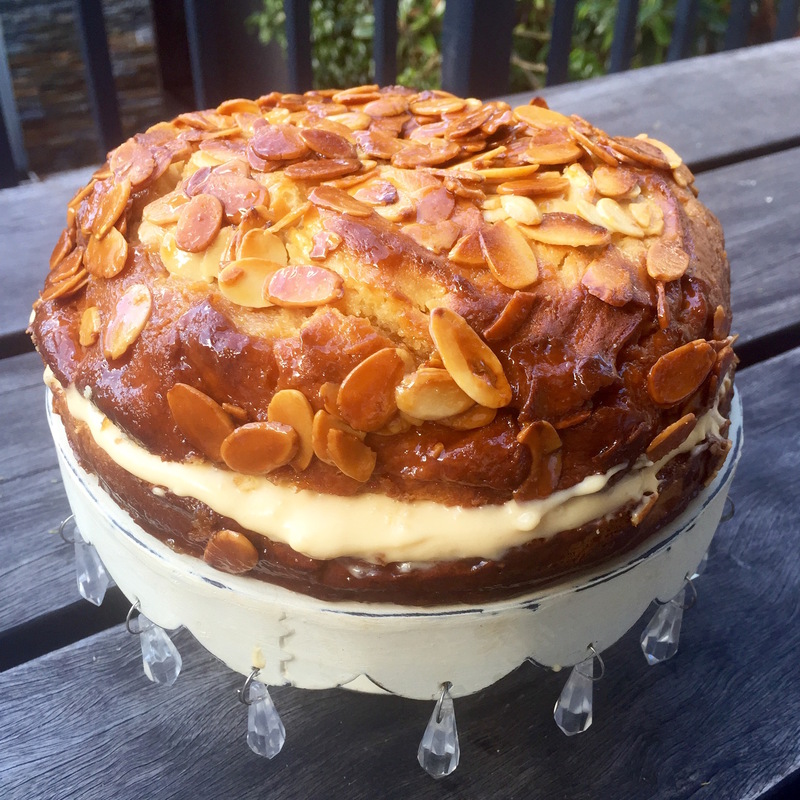 I was first introduced to this glorious honey almond caramel crusted, crème pâtissière filled confection at a Danish birthday party, many, many years ago. Freshly baked, its soft cake-y brioche like layers sublime, so utterly indulgent, I had never tasted anything quite like it before. Unusual and rather exotic, this sweet yeast cake made quite an impression. Particularly so as it also has a rather charming story attached to it. Folklore has it bienenstich was invented by the bakers of Andernach to commemorate a famous day in 1474 when their townspeople successfully repelled invaders from the neighbouring town of Linz by lobbing beehives at them. Stung by the bees the attackers fled, and to celebrate victory a very special honey cake was made. It’s almost ironic that Linz almost happens to be the home of one of my other all time favourite bakes Linzertorte, whose origins date back to 1653 and is widely touted to be one of the world’s oldest cakes. It does strike me that, if the legend is true, the origins of Andernach’s Bienenstich predate those claims by almost 200 years! Over the years, on the basis of just one delicious yet fleeting memory, I have been on the hunt to rediscover bienenstich. Unfortunately bee sting cake is only rarely found on bakery or cafe menus, and when it does can often be disappointing. The secret to any wonderful cake is freshness. Yeasted cakes, in particular, are best eaten on the day they are made, not left to languish in refrigerators or display cabinets. Just a fortnight ago, my interest in bienenstich was reignited through an image in my instagram feed promoting Oktoberfest. 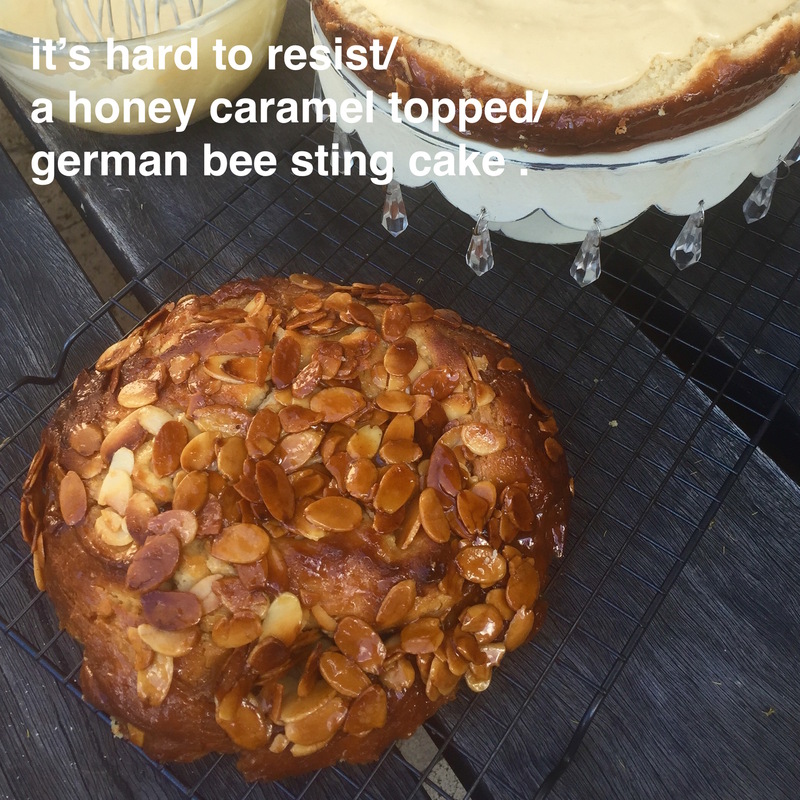 And so it was, that I have spent the better part of the week researching bee sting cake and cobbling together my version of the perfect trinity of soft, yeasted coffee cake, honey almond caramel and thick luscious crème pâtissière. Granted not an every day sort of bake, but I promise you it really isn’t as complicated as it might seem. The cake layers require no kneading and come together quickly and easily with the aid of an electric mixer (without a dough hook attachment). Of course containing yeast the cake does need to be proved but can be left to do so overnight. The crème pâtissière can also be made ahead and stored in the refrigerator until needed, or perhaps purchased from a sympathetic bakery. The honey almond caramel is simply stirred together on the stove and baked to burnished perfection in the oven on top of the cake, so couldn’t be easier. For me, I love that the hunt is over and that I can make this cake at home, probably not often, but whenever I please. SCALD milk to blood temperature. The easiest way to do this is to heat ¼ cup milk to boiling point then add ½ cup cold milk. If the milk is too hot or cold the yeast will not bloom correctly. STIR together yeast, 1/4 cup of the warm milk, and 1 tablespoon honey in bowl of mixer until yeast is dissolved, then let stand until foamy, about 5 minutes. If mixture doesn’t foam, discard and start over with new yeast. ADD flour sugar, salt, eggs, butter and remaining milk to the yeast mixture. Beat at low speed until it forms a soft and sticky but cohesive dough, about 5-8 minutes. SCRAPE down the sides, then cover with plastic wrap and leave to prove and rise in a warm, draught free place for an hour until light and puffy (not necessarily doubled in size). BUTTER and base line a 20cm round spring-form (removable base) cake tin. Spread mixture in an even layer over the base of the tin. Cover with plastic wrap and set aside to prove for a further thirty minutes. MEANWHILE prepare the honey almond caramel topping. In a medium saucepan, combine unsalted butter, sugar, honey and a pinch of salt. Bring to a gentle boil, then remove from heat. Add ¾ cup sliced almonds. Stir well to combine. Set aside. PREHEAT oven to 180 C. Line an oven tray with foil or baking paper. AFTER second proving, pour honey almond caramel topping evenly over the yeasted cake batter. PLACE tin on lined tray to catch any caramel drips and bake in pre heated oven for 20-25 minutes until caramel is golden and a skewer inserted into the centre of the cake comes out clean. REMOVE from oven and place tin on a wire rack to cool a little before loosening sides and removing cake from tin. You may need to gently run a palette knife around the rim, whilst the cake is still warm to loosen any residual caramel. WHEN completely cold, use a long serrated knife to slice the cake in half crosswise into two layers. SANDWICH with a generous amount of crème patissiere (recipe follows). Serve immediately or refrigerate until required. USE the tip of a sharp knife to split the vanilla bean lengthwise. Scrape along the cut surface to collect the seeds. Combine the milk, vanilla seeds and pod in a large heavy based saucepan and bring to a simmer. WHILE the milk is heating, whisk the egg yolks with sugar in a large mixing bowl until pale, thick and creamy. Then add the cornflour and whisk to combine. REMOVE the vanilla bean pod from the milk. In a steady stream pour in half of the warm milk over the egg mixture and whisk until smooth. The heat will temper the eggs so that they are less likely to curdle when added to the remaining saucepan of hot milk and brought back to the boil. POUR the egg mixture back into the saucepan with the remaining milk. Whisk quickly and constantly, over a medium low heat and bring the mixture mixture back to the boil. Remember to pay attention to the edges as you stir so the mixture doesn’t catch and stick to the bottom of the saucepan. CONTINUE to whisk for another minute to cook the cornflour through. The mixture should be very thick and smooth and a little difficult to stir. REMOVE the saucepan from the heat. If using the butter, allow the pastry cream to cool a little before gently stirring in a few cubes of butter at a time. The butter will give the pastry cream a richer taste and lovely sheen. POUR the prepared pastry cream into a clean shallow baking dish and dust with icing sugar to prevent a skin from forming. Cover with cling wrap and cool completely, at least 2 hours. Refrigerate until needed, up to 3 days. WHEN ready to use whisk the pastry cream to loosen a little. At this stage you can stir in a little liqueur if using. For a light pastry cream fold in a little softly whipped cream with a flat spatula, just before using. For me one of the first signs that Spring has well and truly arrived is the appearance of plump, emerald green spears of sweet and tender new season asparagus. I love nothing better than to swaddle them in salty prosciutto. 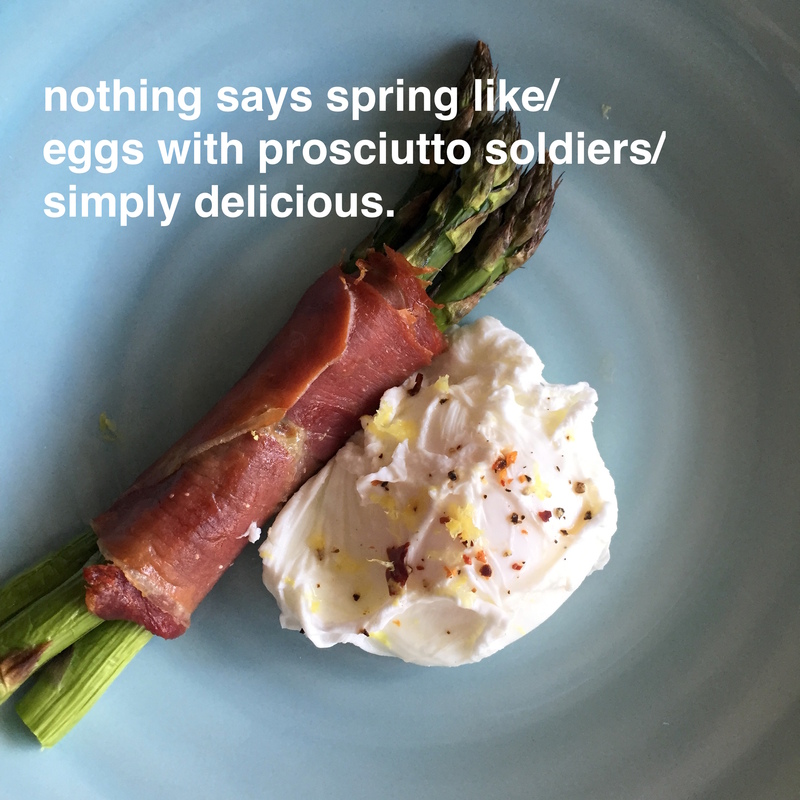 Baked or grilled until the prosciutto is golden and crisp, these little prosciutto wrapped asparagus “soldiers” also happen to be a wonderful accompaniment for perfectly poached farm fresh eggs. And so it is that I have happily stumbled upon another effortless yet simply delicious 5-2 fast day idea. At just 102 calories per serve, it’s quickly becoming one of my all time fast day favourites. My go to late morning hunger buster that satisfies but more importantly still leaves room for that all important substantial evening meal. PRE-HEAT oven or grill to high. BUNDLE together asparagus spears and wrap with a thin slice of prosciutto, starting at the bottom and spiralling to the tips. PLACE prosciutto wrapped asparagus on an oven tray and place under hot grill for 5-6 minutes, turning once half way through, until prosciutto is crisp and asparagus spears tender. MEANWHILE fill a medium saucepan with water and bring to the boil. Add a pinch of salt, and a teaspoon of white vinegar. CRACK egg onto a small saucer. Stir the boiling water vigorously with a spoon until you have a whirlpool then slide the egg carefully into its centre. TURN heat down to low, and cook for three minutes – use a timer to prevent overcooking. Remove egg from the water with a slotted spoon, and drain on kitchen paper. SERVE immediately with prosciutto wrapped asparagus soldiers. Garnish with a dusting of finely grated lemon zest, chilli flakes and freshly ground pepper. I can’t quite recall where I first encountered the idea of charred watermelon. It does sound incongruous and strange; the searing of a cool and refreshing summer fruit on a hot barbecue or grill, but it’s a juxtaposition of hot but cold, and savoury yet sweet, that really does work. I know. I’ve tried it and it’s true. Usually we devour juicy watermelons as they come, sliced and chilled. In the height of summer when they’re ripe and heavy, and at their peak season best, I might transform them into refreshing paletas and granitas or home-made lemonade. Other times they find their way into a simple salad or perhaps paired with grilled haloumi and chimichurri, all building blocks for an effortless but refreshingly delicious meal. 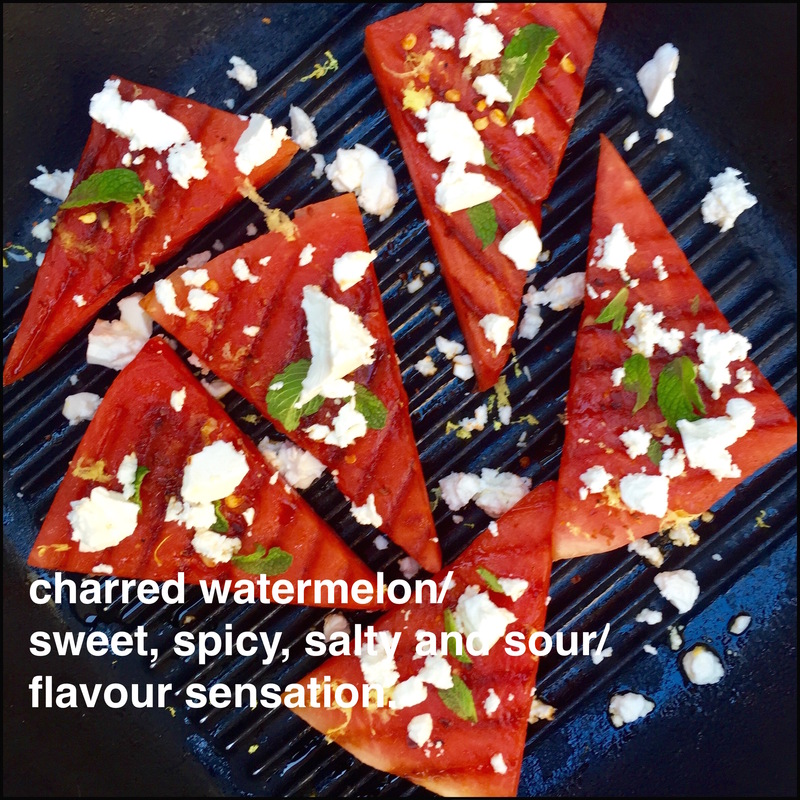 I love how charring caramelises the melon’s natural sugars and renders each slice impossibly juicy and plump. Paired with chilli, lime, mint and feta, it produces a sweet, spicy, salty and sour flavour sensation that easily disguises the fact that a generous serve is just 180 calories. All in all its a very clever 5-2 fast day recipe idea, that easily dispels any notion that healthy meals need to be boring. HEAT a griddle pan until smoking. Lightly brush watermelon slices with olive oil and season with sea salt flakes and freshly ground pepper. GRILL on each side for a minute or so until lightly charred and caramelised. ARRANGE in a single layer on a serving platter. Dress with a dusting of chilli, finely grated lime zest and fresh mint leaves. Crumble over feta and finish with a good squeeze of lime juice. Serve immediately. Anyone who follows my Instagram feed will realise that recently I embarked on the 100 day haiku challenge. Seventeen syllables of poetic creativity a day, structured into three lines; the first containing just five syllables, the second seven, and third five like the first. All food centric by my choosing. It’s an addictively consuming and sometimes frustrating process. How to capture the essence of something in just a few short words. I’m getting back to basics and learning a lot about simplicity, clarity and economy of thought. Probably the last time I encountered a haiku was way back in primary school, set no doubt as a homework task for my ten or eleven year old self. Surprisingly, I’m finding haiku writing to also be a rather nostalgic process. I’m delving into the half forgotten recesses of my mind and reminiscing about all manner of miscellaneous, sometimes peculiar things. Like old fashioned rice pudding. Straight out of any nanna’s old fashioned frugal kitchen. Well made it was lovely and comforting; gorgeously luscious and creamy. Truth be told I honestly can’t remember the last time I made a rice pudding. If I believe my teenagers – never in their collective lifetime. 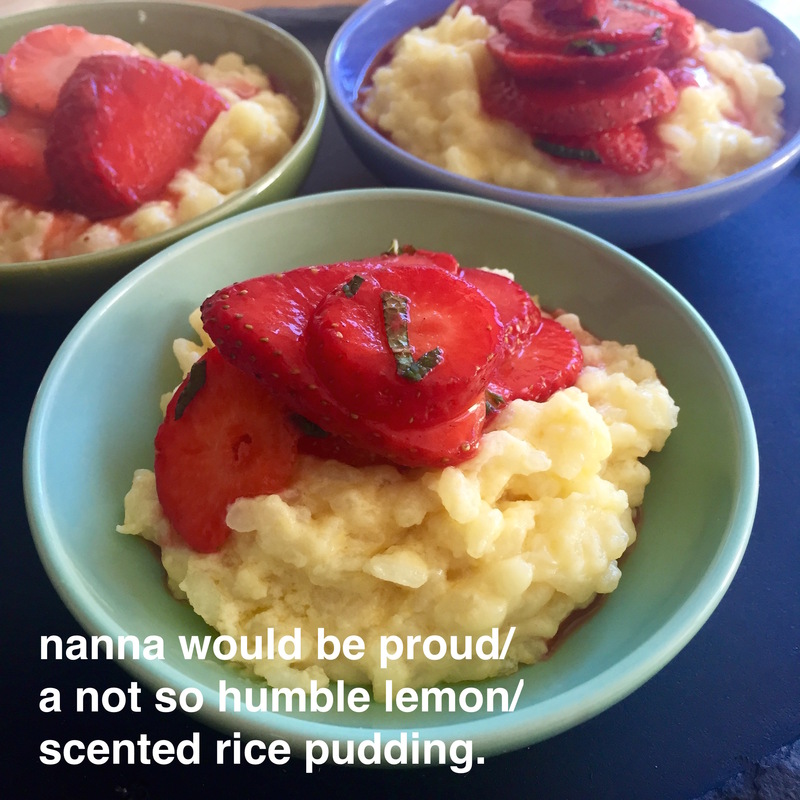 And so it was that this past week I took a trip down memory lane and recreated Nanna’s rice pudding. My rather decadent modern version is lemon scented and uses arborio rice with copious, not so frugal, amounts of butter, eggs, milk and cream. All topped off with a balsamic, basil infused strawberry salad. A “dessert” that is equally delicious warm or cold and easily crosses over for breakfast or brunch. MELT butter in a medium ovenproof saucepan over medium heat. Add rice and cook, stirring frequently, until well coated and lightly toasted, about 2 minutes. ADD lemon zest and sauté until fragrant for 1 to 2 minutes, before adding milk, cream and sugar. Stir well to combine. COOK rice gently over a low heat for about 20 minutes, stirring occasionally. Cover with a tight-fitting lid and place in preheated oven to bake for 10 minutes as you prepare the custard. WARM milk in a small saucepan. In a separate bowl, whisk together eggs, lemon and caster sugar until pale and light. In a slow steady stream, pour the warmed milk into the egg mixture, whisking well to combine. REMOVE rice from oven, uncover and add the custard mixture, stirring well to combine. Replace lid and return to the oven to bake for a further 20 or so minutes until thick and creamy, yet still a little loose. The custard will continue to thicken as it cools. COMBINE strawberries, basil, caster sugar, balsamic vinegar and lemon juice in a medium bowl. Set aside to macerate for 5 minutes or so. SPOON warm or cold rice pudding into small bowls or glasses. Spoon over balsamic basil strawberries and their juices. Serve immediately.